Unwind from the stresses of the holidays with a coloring book that is personalized for you. 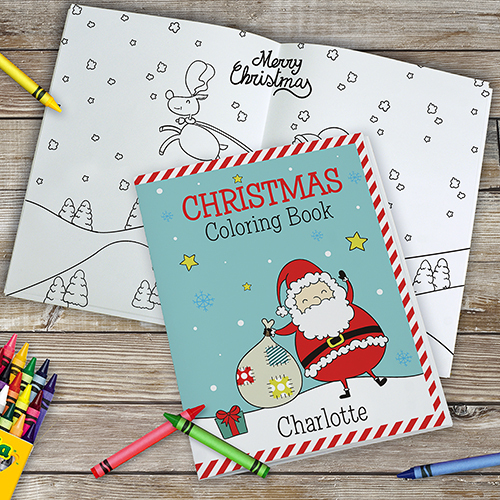 Featuring a variety of Christmas and holiday designs, this coloring book makes a great gift idea for everyone young and old. Personalized with any name, this coloring book can be a great stocking stuffer for the coloring advocates in your life. Approximate Coloring Book Size: 9" x12"
the coloring books are so fun with the personalization Thanks! Im sure the grandkids are enjoying them but I havent heard. Additional Details These personalized coloring books need the perfect place to wait for Christmas morning - in personalized stockings! Order a set for your favorite people today!